The north dome of the Quelccaya Ice Cap in Peru in 2003. Researchers at The Ohio State University found evidence of human-produced air pollution within the ice that predates the industrial revolution by more than 200 years. Photo by Paolo Gabrielli, courtesy of The Ohio State University. In the 16th century, during its conquest of South America, the Spanish Empire forced countless Incas to work extracting silver from the mountaintop mines of Potosí, in what is now Bolivia—then the largest source of silver in the world. The Inca already knew how to refine silver, but in 1572 the Spanish introduced a new technology that boosted production many times over and sent thick clouds of lead dust rising over the Andes for the first time in history. Winds carried some of that pollution 500 miles northwest into Peru, where tiny remnants of it settled on the Quelccaya Ice Cap. There it stayed —buried under hundreds of years of snow and ice— until researchers from The Ohio State University found it in 2003. In the early online edition of the Proceedings of the National Academy of Sciences, they report discovery of a layer within a Quelccaya ice core that dates to the Spanish conquest of the Inca, contains bits of lead and bears the chemical signature of the silver mines of Potosí. 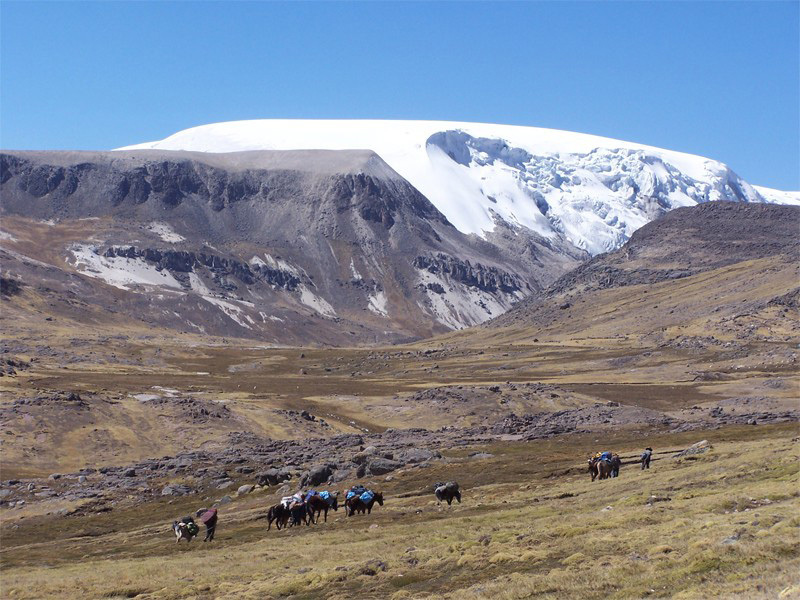 The core provides the first detailed record of widespread human-produced air pollution in South America from before the industrial revolution, and makes Quelccaya one of only a few select sites on the planet where the pre-industrial human impact on air quality can be studied today. “This evidence supports the idea that human impact on the environment was widespread even before the industrial revolution,” said Paolo Gabrielli, a research scientist at the Byrd Polar and Climate Research Center at Ohio State and corresponding author of the study. Lonnie Thompson, Distinguished University Professor of earth sciences at Ohio State and co-author of the study, called the find “another keyhole into the past of human activity in that part of the world,” and suggested that further investigation could ultimately help us better understand the fate of pollution circulating in the atmosphere today. Previously, Thompson has called the Quelccaya ice cores a “Rosetta Stone” for gauging Earth’s climate history. The samples were cut from ice that formed over 1,200 years as snow settled on the Peruvian Andes. Layer by layer, the ice captured chemicals from the air and precipitation during wet and dry seasons for all those years. Today, researchers analyze the chemistry of different layers to measure historical changes in climate. For this study, the researchers used a mass spectrometer to measure the amount and type of chemicals present in the ice dating back to 800 AD. They looked for antimony, arsenic, bismuth, molybdenum and especially lead. That’s because the refining process that the Spanish introduced to South America involved grinding silver ore —which contains much more lead than silver— into powder before mixing it with mercury in a process called amalgamation. So atmospheric pollution from silver production would chiefly contain traces of lead particulates. The mass spectrometer revealed some spikes in the concentrations of these elements in the years before Spanish rule, but those layers all likely coincide with natural contamination sources, such as volcanic eruptions. Starting just before 1600, however, the Quelccaya ice began capturing much larger quantities of these elements, and the high amounts persisted until the early 1800s, when South American countries declared independence from Spain. To pin down where the pollution came from, the researchers compared their data with those from a peat bog in Tierra del Fuego, Chile, and from sedimentary lake records from regions including Potosí and other mines throughout Bolivia and Peru. These latter sites would have captured the pollution generated in their local area during that time. The chemical signatures in the Quelccaya ice meshed with what researchers knew from written records: most of the pollution likely came from Potosí, where the Spanish produced the vast majority of silver. Other mines throughout the region contributed to the Quelccaya pollution to a lesser extent. Even in their highest concentrations, the elements entrapped in the ice are not visible to the naked eye and can be detected only through chemical analyses, Gabrielli explained. The section of core containing them has the translucent white appearance of perfectly clean ice. The spread of human-made pollution across vast distances has become common since the industrial revolution of the late 18th century. Greenland received substantial amounts of airborne lead pollution from Europe and the United States until the 1970s, when national policies began requiring producers to change the formulation of gasoline. And some of the pollution currently troubling North American skies has been traced back to Asia, which is experiencing its own industrial boom right now. A question in the scientific community is whether much earlier activity should be included in measures of human environmental impact. For example, ice cores in Greenland contain traces of lead from as far back as the 5th century BC, which were sent airborne by smelting in the ancient Greek and Roman civilizations. This latest ice core from Quelccaya shows that humans generated substantial pollution in the 16th century. Still, the 20th century produced more pollution than any other time in human history. International geological governing bodies are currently considering whether to officially call our current epoch the Anthropocene, or “Age of Humans,” to designate the span of time that humans have been changing the environment. Gabrielli, Thompson and their colleagues hope that the Quelccaya core will inform that debate. In the meantime, they are turning their attention to a core that Thompson’s team drew from the Dasuopu Glacier in southwest China. It is the highest-altitude ice core ever retrieved, and it contains some 8,000 years of climate history. Some of that new trace element record, they hope, will tell new and powerful stories of ancient human activity.